Outside Mexico tourism professionals and journalists ask whether it’s time to promote travel to Oaxaca. Will there be a Guelaguetza? Is it safe? In Oaxaca most locals say ‘yes’ it’s time to promote travel and the sooner the better. True, things remain uncertain (‘unresolved’ is the frequently used word in conversations), but that alone should not deter visitors. During this time of upheaval, many Oaxacans are seeing the bright side of self-organization and more proactive marketing endeavors that are uniting people who once saw each other as competitors. Among the advances – brand new associations for Spanish language schools and bed and breakfast hotels. 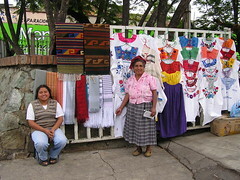 More news about current conditions in Oaxaca on Planeta.com’s guide to Reality tourism in Oaxaca.